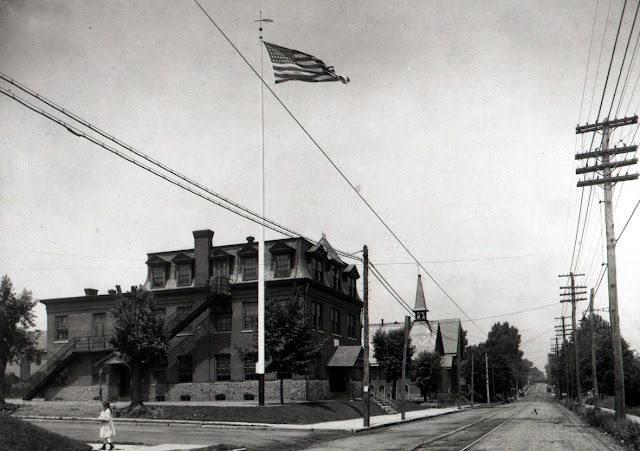 Delaware County History: How old is your school district or school? How old is your school district or school? The Prospect Park Elementary School at 8th and Lincoln Aves. about 1925. The Methodist Church and Masonic Hall are in the background. How old is your school or district? I still laugh when I see the shirts that say “Prospect Park School 1888”, not exactly correct. Prospect Park, the town, was started in September of 1874 and there already was a school in the town, a small one room school house that stood at 13th and Lincoln Aves. That was the “first” Prospect Park School and it operated till 1878 when it was torn down and Prospect students then went to the Norwood School at 652 Chester Pike. That school is now a used car lot. By the summer of 1888 Prospect Park residents petitioned the Ridley Township School Board for their own school. One must remember that Prospect Park was part of the Ridley Township School District till it became a separate boro in May of 1894. Work began on the two story brick, Prospect Park School in August of 1888 and the school was completed just after Christmas the same year. Newspaper accounts say the school officially opened for students on January 2, 1889. The school at today’s Eighth and Lincoln Aves. was used till the new Washington Aves. School was built in the late 1940’s. The site of the old school is the parking lot for the Prospect Methodist Church. How old do you think “Prospect Park School” really is?